Win It Wednesday: Signed Book! Borrowed Souls or Rogue Souls – Winner’s Choice! It’s Independence Day here in the U.S. and I love this holiday. Maybe because I love fireworks. Or because barbecue. Or because I get to make really great pool party playlists. It’s a little odd having the holiday in the middle of the week, as many of us have to work on the days surrounding it. (And if I’m honest, I’m totally getting writing in today.) But we need to celebrate. We haven’t had a Win It Wednesday in a bit, and I figure it’s time to bring it back! My latest Soul Charmer novel Rogue Souls comes out on Monday. (Hope you’re not sick of hearing me talk about it. I just really ridiculously love this book.) So, how about winner’s choice of a signed copy of Borrowed Souls (Soul Charmer #1) or Rogue Souls (Soul Charmer #2)? Get ready for more magic, murder, and rented souls in the Soul Charmer series, which Booklist calls a “fresh take” on urban fantasy. Callie Delgado volunteered to apprentice to Gem City’s Soul Charmer. He’d forced the soul magic ability into her, but now it was hers. She’d learn to control her body’s reaction to rented souls or go up in flames. Literally. 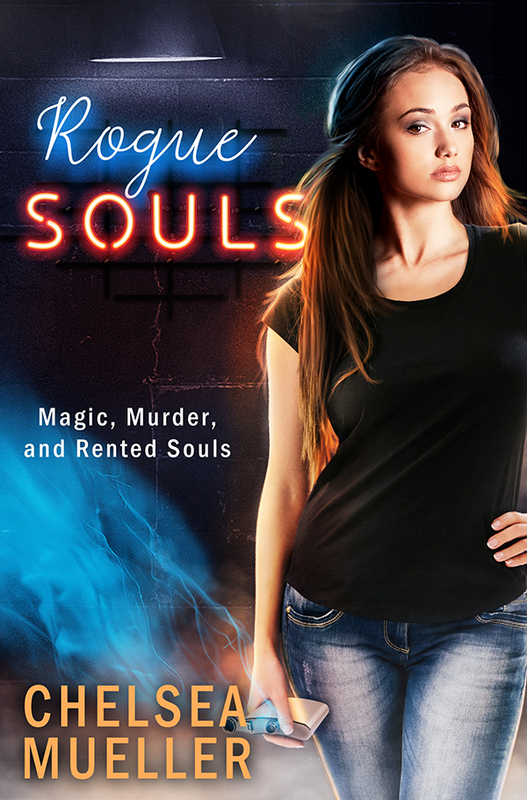 But when bodies begin dropping at the Soul Charmer’s door, it’s up to Callie and her partner Derek to track down the person killing soul renters. The Charmer wants retribution, but Callie is determined to get justice even if it means putting herself directly in the sights of the murderer. If she wants to stay on the Soul Charmer’s good side, Callie must confront her enemies head-on and learn to command rogue souls. …and hope someone she loves doesn’t become the next victim. One lucky winner will get their choice of a signed paperback copy Borrowed Souls or Rogue Souls by Chelsea Mueller. Fill out the Rafflecopter form below to enter. You do not have to share on social media, but if you do you get bonus entries. Same goes for the email sign-up, which will get you VBC stuff, book recs, and book updates from Chelsea Mueller. I have Borrowed Souls and would love to win a copy of Rogue Souls. Thanks for the chance to win a copy. I’m very much looking forward to Rogue Souls! Congratulations Chelsea! Thanks, Shannon! I can’t wait for everyone to get to read Rogue Souls. LOVE this series!! It would make my summer if I won this! TY for the chance! Happy 4th! Would love to win a copy of Rogue Souls. I really enjoyed the first book. Thanks for the giveaway! I loved the first book and can not wait for the second book. Congrats on the new release! Wow! This is an amazing chance thanks for the opportunity. Amazing opportunity. Thanks. Would love to read the first book. Looking forward to reading this. Have it on my nook, would enjoy a signed copy. Something from this author ever since my friend told me about her. I have been in and out of the hospital the last couple of years and I have been playing catch up with my to be read list. I really want to read these books, they sound great.